Join Meg in any of her weekly group classes! Tuesday at 12-1 at Stone Age Climbing and Fitness, Tuesday at 6-7pm at Yoga By Julia. Thursday at Yoga by Julia at 4:30-5:30pm. And Corporate Classes (contact Meg to set up your corporate class)! 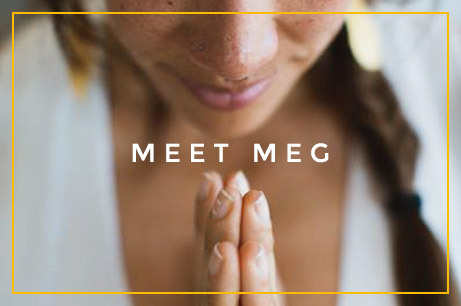 Meg’s one-on-one sessions provide physical, emotional, and spiritual support for your yoga practice. Whether you’re looking to start a new practice, deepen an existing one, or spend time working with an injury, condition, or emotional trauma, Meg will help you reach your personal yogic goals in a warm and loving way. Because of her blend in the healing arts with Reiki, essential oil use, and years of practicing different styles of yoga, Meg’s sessions are healing, balancing, and dynamic. Her services include yoga therapy, postural alignment techniques, alternative healing modalities, and aromatherapy. Throughout, Meg will help you gain confidence, diversify your practice, answer questions, and provide guidance for evolving your yoga practice. In house sessions are available. Reiki derives its name from Japanese and means universal life energy. It is an ancient Eastern practice of holistic medicine that aims to improve overall health and well-being as well as assist in physical and mental recovery from illness. This holistic healing treatment can be a spiritual practice that reconnects mind and body by balancing healthy energy in the body. Yinki® Healing is an individualized session that incorporates yin yoga poses deemed most beneficial for the client, combined with Reiki energy healing and the use of therapeutic-grade essential oils and crystals to enhance energy-balancing and healing. The Raindrop Technique® is a combination of essential oil application and rhythmic movements that help bring the body into balance, release blockages, and align the energy centers of the body. Drops of essential oil fall like soft gentle rain onto the back. All oils are applied, then smoothed, and fanned over the nerves. The essential oils are absorbed through the skin into the entire body. The combination of the oils’ healing properties and the body’s natural electrical frequencies create optimal balance for physical and mental health.